You may want to run 64bit ISO images of many GNU/Linux systems (i.e. GuixSD and Trisquel) using a virtual machine. You may have a 64bit laptop without virtualization support like mine. Then also you may have heard that virtualization systems like VirtualBox doesn't work if your laptop doesn't support virtualization (Intel VT or AMD-V). So, is there really no solution running ISO without virtualization support? The answer is there is a solution and that is QEMU, the full hardware emulator. 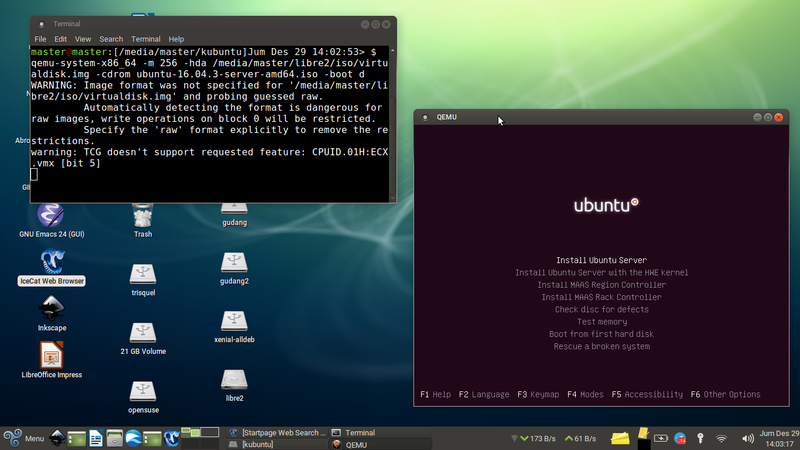 Surprisingly, it's very easy to run any OS with QEMU command line once you know the examples. 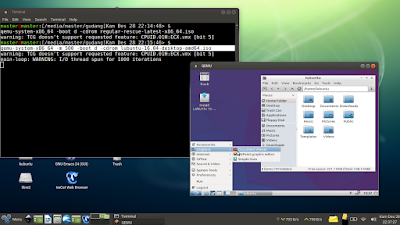 This article shows 2 examples in running GNU/Linux OSes with QEMU on an old laptop without KVM, without Intel VT support. Happy running! You don't need to use sudo or root privilege (except, to run external drive). To close a running VM, press Ctrl+C at the Terminal or simply close the VM window. QEMU runs slower than VirtualBox (or another VM similar to VirtualBox). So be patient, you may find running same OS slower at QEMU than at VirtualBox. Press Ctrl+Alt to escape mouse cursor from the VM window. I suggest you to test small distros first (e.g. Ubuntu Server without GUI) before big distros (e.g. Ubuntu Unity or PureOS) to see the performance.